The Gunfighter Meets His Match, recently at NYMF, successfully marries the classic American aesthetic of the Old West to the modern, enchanting, original music of singer/songwriter Abby Payne. Abby Payne’s music is the greatest strength of the production, without a doubt. She has clearly developed her style through a musical portfolio born more out of a concert venue than a stage—to her credit. She avoids the hackneyed conventions of musical theatre and gives us music that is fresh, and expressive; the kind of music that makes you perk up and listen more intently. Ms. Payne is featured in the show as the pianist and leader of the band, as well as “May,” a featured character hardly featured enough. She sets a high bar kicking off the first musical number of the performance, and the audience spends the next hour and forty five minutes wishing we could hear her more often than we do. Her music is the star of the show, and her voice is the underutilized gem of the production. Fortunately, the Ms. Payne has recorded the music from the show as a personal album available online, and it holds its own as a great individual album even without being framed by the stage production. 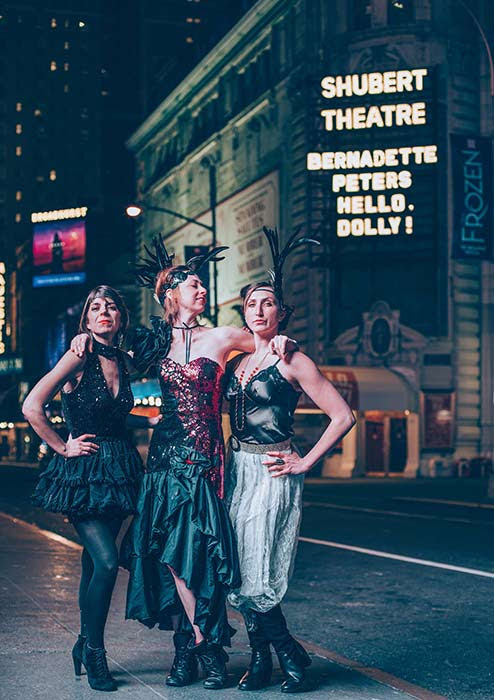 While the music is the well-refined backbone of the production, it is still a production in development, as is usually the case with NYMF shows. Ms. Payne is not as talented a book-writer as she is a musician. The story is in many ways classic, yet still interesting, but needs to be better anchored in the believability that comes with stronger character development. The story needs to anchor the characters in a world where their actions and decisions mean everything to them, and thus to the audience. The outline of a good story is there, and with some development it may be able to match the high-bar set by the music. Setting the show in the Old West, while distinct in its choice of identity, was a mixed bag overall. The show succeeds in its occasional self-aware satire of Western-clichés, but is at times funny in ways where the audience isn’t entirely sure if it’s intentionally over-the-top, or if its just bad. The style of the Old West was hard to believably capture for much of the cast. It is a production where we are often given accents instead of acting. Several actors were too presentational throughout, in a way that comes across as insincere. The underwhelming costume design and cheap props, a regrettable necessity of many NYMF-show budgets, did not help matters. The choreography by Jeff Davis, executed expertly by Chelsea Retzloff and Randy Burd, in particular, was creative and engaging. I did not expect to find so much dance in the Old West, but I was thankful that the show gave an avenue to such grace of movement. –Shara Radin, the featured operatic Soprano. There’s nothing about the music anywhere else in the show that skews towards opera, but when you have Ms. Radin on board, any time she’s featured is a win for the audience. –Ryan Lanning as Dane, a villain with both charisma and wickedness. It’s a hard thing to walk the fine line of likeability of performance and despicability of character. Mr. Lanning walks it expertly. –Kristen DiMercurio, the heroine, is the brightest star of the production. Both as a well-grounded actress and a rich, expressive voice perfectly suited to the music, one feel privileged every time she returns to the stage. I’m thankful that the show is a vehicle to let her do what she does so well. Ms. DiMercurio is alone worth the price of admission. The Gunfighter Meets His Match at NYMF is a strong start to what I hope is a promising journey for the production. The music makes it, and if it continues to build on its moments of brilliance with greater resources, more selective casting, and further development of the book, it has the potential to be the kind of original work that musical theatre is waiting for.